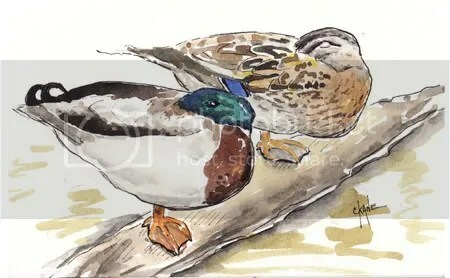 Sleeping Mallard Sketch – Let's Paint Nature! I found this pair of mallards sleeping on a branch in a pond right next to the trail. So close in fact, that I was able to walk right next to them and take a photo. As I approached the male, one eye opened…and then closed. Two seconds later the female’s one eye opened…and then closed. I said to myself, “Oh you’re just fake sleeping!” It reminded me of my children on Christmas Eve night, too excited to really fall asleep, they lay still with eyes closed trying to be good, but occasionally opening one in hopes of seeing a man in a red suit. After doing a little research on the mallard duck, I discovered that mallards as well as some other birds, sleep with half of their brain awake and aware of what is going on, even alert enough to look around and the other half asleep. The eye that opened to see if I was dangerous was controlled by the hemisphere that was awake. How amazing. Here is an article which describes what is taking place. I am fascinated with wildlife behavior. Their intentions are pure; violent or kind, it doesn’t matter, they are true intentions. Animals cannot look you in the eye, tell you one thing while believing the opposite in their hearts like humans. This is why I love wildlife. Sometimes I consider the complete lack of guile of canine kind. There is NOTHING so honest in all the world as a dog. Even when they’ve done “wrong” they can’t pretend they didn’t. They fess up immediately & give you that look begging for your forgiveness. The world would be a much better place if we sought to emulate dogs. Dave: Thanks! I had a lot of fun with this one. 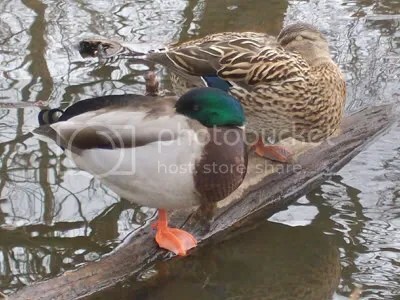 All things nice: Mallards do not mate for life, but this couple seems to be a nice pair, huh? Lana: Very nicely said…you are so correct. Yes, the world would be a much better place if we sought forgiveness and didn’t hide behind pride. You are the women! This is really weird, but after looking at your sketch I was dreaming about mallard ducks, they were strange dreams though. They had entered the window of my house and I had to try and get them out without harming them. I had also spotted a swan on the side of the road during the week so this is probably where I got the idea of not harming the birds but the ones in the house were mallards. So I must have been thinking of your sketch.